Marketers continue to struggle with ways to measure their return oninvestment (ROI) from advertisements placed on the Internet. With thetotal global value of Internet advertising in 2011 forecasted to exceed$70 billion (MagnaGlobal, 2011), decision makers have to continue tofind new and better ways of tracking their firm's increase in utilitygenerated by online ad spend. Born from this predicament, researchersand practitioners have begun to develop better metrics from which afirm can assess the overall impact of their Internet advertising. This paper examines and critiques leading methods of measuring ROIthough the Internet, and it argues for measurement of both short-termand long-term metrics. In the long run, some version of the brandscorecard approach is desirable, provided it uses effective measures forboth the short-term and long-term levels of analysis. The study concludeswith recommendations for future research in this area. Marketers have struggled to find effective ways to measure their return on investment (ROI) from advertising on the Internet. While there was much initial enthusiasm for Internet advertising in the late 1990s and early 2000s, it soon became obvious that click-through rates for many pop-up ads were low and that other types of early Internet ads (e.g., email, newsgroup) were having somewhat limited success in many contexts. In the mid-2000s, as advertisers became more sophisticated in using the Internet and online advertising started becoming more effective for many businesses, it became clear that there was a need to work on advanced measures of return. Clearly, some early measures of effectiveness, such as unduplicated hits on a website, were clearly problematic. As a result, a debate about how to best measure ROI from Internet advertising has ensued over the past several years. The Internet became a major advertising medium by 2005, spurred by the growth of users; a broader base of users (i.e., wider range of demographic groups) to be targeted; better technology and growth of broadband; and the advanced selling of space on search engine sites such as Google and Yahoo (Megabrand Spending by Media, 2005; Taylor, 2009). The expansion of new interactive media, such as SMS messaging, user-generated-content websites, and social media, further created a need to develop better techniques for measuring ROI for the broader category of interactive advertising (e.g., Barnes and Scornavacca, 2004; Carroll, Barnes, Scornavacca, & Fletcher, 2007; Choi, Hwang, & MacMillan, 2008; Okazaki, 2008; Ramaprasad & Harmon, 2007; Taylor, 2009). While there is broad agreement that attempts should be made to measure ROI from interactive advertising, a debate has ensued regarding the best technique for doing so. Compounding the issue is the disagreement among academics and practitioners concerning both the metrics and methods used in calculating ROI from marketing and/or advertising in general. Clearly, measuring ROI from advertising is not an easy task. In 2005, Advertising Age ran a special section that referred to marketing ROI as “the marketer’s obsession”; the section also covered the debate on the degree to which ROI can be measured effectively (Neff, 2005). As this general debate has gone on, conflicting viewpoints have arisen in the advertising community on how a firm should track its ad spend online and to which part of the firm returns should be credited. Therefore, the methods and metrics used by firms to measure ROI become increasingly important. Since its inception, the Internet has offered a targeted medium from which to communicate with potential consumers. Messages can be tailored directly to a firm’s desired target audience. Moreover, the Internet has demonstrated the potential to engage the consumer at a deeper level than many traditional media due to the higher degree of interactivity it is capable of delivering (Macmillan, Hwang, & Lee, 2003). As a result, it has been observed that the Internet has significant brand building capabilities (Chiagouras & Wansley, 2000). Thus, it makes sense that marketers want some measure of the degree to which advertising on the Internet and in other media helps to build a brand. With the global Internet advertising industry set to grow by 12.5% to $70.9 billion USD in 2011 (MagnaGlobal, 2011), marketers continue to struggle to achieve message clarity in this crowded space. Due to this considerable growth in Internet advertising, the need for some type of effective ROI measures has become critical and will only grow in importance moving forward. As measured by growth and global dollars spent, some of the most popular types of interactive advertising include search engine advertising, online video advertising, mobile advertising, and advertising through social media (MagnaGlobal, 2011). Search engine advertising is comprised of advertisements that appear alongside search results through popular search engines, such as Google and Bing. Search results are generated through algorithms that process inputs, including a user's location and keywords entered, to generate unique and targeted outputs for each user. In 2011, firms are forecasted to spend $34.9 billion USD on search engine advertising, a 14.4% increase from 2010 (MagnaGlobal, 2011). Online video advertising is comprised of videos produced by a firm or its customers that are intended to be streamed or downloaded by users. These also include viral videos, which are sometimes leaked online as part of a guerilla marketing technique designed to disguise the identity of the firm (see Southgate, Westoby, & Page, 2010). This form of advertising has become increasingly popular, due in part to the higher usage of sites such as YouTube and the availability of streaming video on mobile devices. On an aggregate level, global spending on online video advertising is expected to increase by 40% in 2011 to $4.7 billion USD (MagnaGlobal, 2011). In addition, mobile advertising (see Okazaki, Katsukura, & Nishiyama, 2007) is another growing medium that has exploded in the past five years due to the proliferation of mobile phones around the globe. Firms are able to track a user’s location though his or her mobile phone and send that user alerts advertising a product or special promotion that may be nearby. Users can also sign up online to receive alerts from a particular firm or company that advertise special deals on merchandise or deliver other critical messages. Of course, advertisers also have the option to send brand building messages as well. This innovative form of advertising has grown 32% to a revenue of $2.7 billion USD worldwide (MagnaGlobal, 2011). Additionally, advertising in social media has become one of the fastest growing and most popular forms of interactive advertising available to firms. With billions of users around the world and the ability of social media sites like Facebook, Cyworld, Myspace and Renren to target ads to specific users, social media is posited to continue to grow in popularity among advertisers. eMarketer reports that in 2011, advertising in social media is expected to exceed $3 billion USD (eMarketer, 2011). Why is ROI so Hard to Measure? Developing a reliable and consistent measure for return on investment (ROI) from Internet advertising has baffled both academics and practitioners. Taylor (2010) has called for an increase in research in this area due to the strong debate on the current measures being used to calculate ROI. Taylor explains that there is currently a dispute regarding the validity of applying traditional ROI metrics for marketing and advertising. Several authors have correctly pointed to limitations in applying ROI principles to marketing. For example, Ambler and Roberts (2008) discuss key limitations associated with measuring ROI by the three primary traditional techniques: ROI, discounted cash flow, and return on customer. Ambler and Roberts argue that a single “silver bullet” measure is likely not possible, suggesting the need to factor in multiple measures and criteria in any assessment of ROI. Percy and Elliot (2005) have argued that it is important to consider ROI, but that confounding effects make it very difficult to measure. These authors go on to advocate a fundamental focus on following effective principles, as they will, in turn, lead to better ROI even if perfect measurement is not possible. Schultz and Schultz (2004) provide another important perspective, arguing that the best ROI measures are based on attitudinal measures (see Frieswick, 2001) and stressing that both short-term ROI and long-term financial measures should be considered. Taylor (2010) goes on to address the question that exists both in the literature and in practice regarding the most practical and accurate ways to measure ROI. He concludes that despite the best efforts of the authors who have published in this area, the debate still remains open as to the most effective way to measure the ROI on a firm’s marketing communications and advertising expenditures. However, he also concludes that the weight of the evidence clearly documents the need to have such measures, even if they are imperfect and multiple measures are needed. Such documentation of effectiveness is critical in an environment where chief financial officers are scrutinizing all expenditures and demanding that support of returns be provided during the budgeting process. Thus, it makes sense that a combination of useful short-term ROI measures with longer-term measures, will be helpful to firms. An issue that most practitioners face is there are multiple ways to measure ROI. In a CMO council study cited in the Harvard Business Review, 80% of marketing executives were unhappy with their firm's ability to measure ROI (Clancy & Stone, 2005). Furthermore, fewer than 20% of executives surveyed felt that their firm was able to accurately measure ROI (Clancy & Stone, 2005). Even with improved metrics, executives are not confident that they are able to track the return of their expenditures. The aforementioned numbers show that there is a pressing need to further refine and develop new measures for calculating ROI. The continued exploration into what has been effective in the past and what will become effective in the future will need to be tackled by both academics and practitioners. However, the present need remains for a effective and consistent measures of ROI. Many of the early measurements of return on investment (ROI) have been either inaccurate or flawed because the comprehensive effects of advertising expenditures on the firm were not considered. 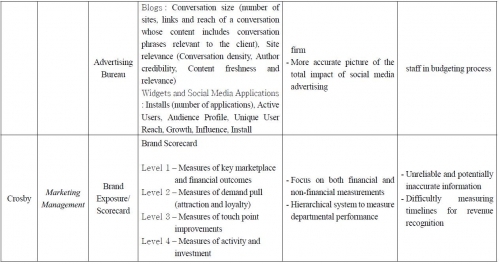 Academics and practitioners are beginning to realize that some traditional methods of ROI are not effective when measuring Internet and social media advertising. Early measurements of ROI tended to focus on financial metrics. Some of these include discounted cash flow (DCF), sales revenue, stock price, and other top-line measurements (Ambler & Roberts, 2008). The exclusive use of financial metrics by marketers results in a confused reliance on data that may not give the firm a true picture of the return it receives on advertising expenses. There are reasons why this method has not been effective for many advertisers. First, ROI is an incremental measurement; therefore, a firm must provide baseline measures that account for sales before advertising expenditures. According to Ambler and Roberts (2008), it is difficult to provide these estimates because firms rarely have baseline numbers of sales and overall revenue without any advertising expenditures. Obviously, it is also difficult to isolate the effects of a single variable on a dependent measure, such as sales, when so many different variables affect that measure. This fact makes traditional ROI in the financial sense extremely difficult to calculate. Thus, using simple correlations between advertising and sales can lead advertisers to make decisions based on information that is inherently flawed. In addition, measuring ROI in the same way that firms assess other forms of investments – such as stock price, P/E ratios, and other traditional financial measurements – is based on unsound logic (Ambler & Roberts, 2008). Advertising is neither a traditional “investment,” nor is it accounted for as such on a firm’s ledger (Ambler & Roberts, 2008). Advertising expenditures do not typically yield traditional “direct” financial returns to a firm, and therefore can and should not be treated the same by managers and executives (Ambler & Roberts, 2008). This fundamental difference in perception causes a tremendous amount of inconsistency when evaluating ROI from Internet advertising alongside other financial investments by the firm. In summary, the fundamental issues with the application of traditional financial measures to advertising and ROI are: 1) there are many confounding factors that make it difficult to precisely separate out the impact of advertising in the short term; and 2) the longer-term effects of advertising, such as improving attitudes toward the product and building brand equity, are not taken into account. In spite of these problems, it is important to consider the principles/concepts associated with ROI measurement in developing better techniques. Even if these problems cannot be completely overcome, estimates of such a measure in both the short-term and long-term are a desirable goal. 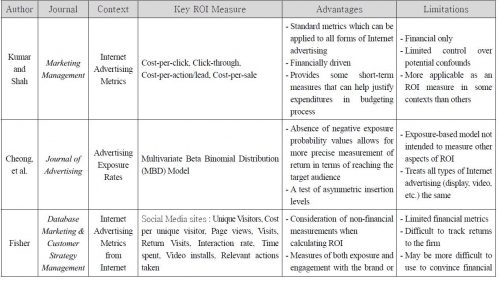 Academics and practitioners have proposed measuring ROI from Internet advertising by obtaining numeric measurements such as hits, unique visitors, and page views (Fisher, 2009). These measurements have been used since the inception of the Internet and have been adopted as ROI measures by many marketers for more than 20 years. There are many problems with using each of these measures. First, measuring “hits” does not offer marketers any detailed information about the viewers of the website; it only measures the amount of times a website has been opened by a user or users. Measuring hits does not provide demographic or psychographic information about that user, nor does it necessarily return any measurable benefit to the firm. For example, “unduplicated hits” have been shown to be a particularly bad measure for advertisers to rely on. This is because, if all we know is that an ad on a website has been viewed 50,000 times, we do not know whether one person visited the website 50,000 times, or 50,000 different people visited the website one time, or if the answer is somewhere in between these numbers. In addition, numeric measures alone do not provide a firm with an accurate picture of its financial or non-financial benefits. Unique visitors and page views track only the user's viewing patterns of an advertisement, not how viewing the advertisement affects the user's perceptions of a brand or his or her purchase intentions. The only cause and effect measurement listed above is cost-per-click. Cost-per-click is the amount spent by an advertiser to generate a click-through from their advertisement to a pre-determined landing page (Kumar & Shah, 2007). For example, if an advertiser spent $100 to generate 1,000 visits to a company website, then the cost-per-click would be $0.10. Firms can use this measurement to show short-term ROI due to the direct cause and effect demonstrated by the advertisement. This method is used by firms to direct their advertising spending to the most desirable locations on the Web, meaning those sites that generate either a large number of click-throughs or offer a decreased cost-per-click. While ultimately a financial measure, cost-per-click tracks traffic to the site, as opposed to bottom line revenue. This is an important limitation, as is this method’s inability to account for non-financial measures (such as brand building capacity), which have become increasingly important for advertisers. While cost-per-click measures can provide a useful snapshot of short-term ROI in some contexts (e.g., the consumer has not been exposed to other advertising), in most contexts it is also subject to the effects of potential confounding variables. Thus, while numeric measures can have some utility, when used in isolation these measures present difficulties in terms of estimating both financial and non-financial returns. Finally, the other classifications of previously used measurements of ROI are documented by Schultz and Schultz (2004); these include focus groups, consumer perception surveys, and other subjective measurements of consumers' attitudes toward a brand and their purchase intentions. While these methods address some of the criticisms proposed by using only financial or numeric measures, they are less direct in terms of being easily quantified and applied to budgeting decisions. There are some limitations with these approaches. With respect to focus groups, generalizability is often a question, though a properly conducted set of focus groups can partially allay these concerns. Surveys using appropriate sampling techniques can help with the generalizability issue, but the perceptual measures involved are less relevant to financial managers who make budgeting decisions. Consumer perception surveys and measurements of individual purchase intentions do have limits in terms of their projectability to actual purchase behavior. Still, as will be discussed, if well conducted (and if approached longitudinally in at least some cases), consumer perception studies following exposure to advertising can also have the key advantage of providing insight into the longer-term impact of the advertisement. Due to the inability of the aforementioned measurements to accurately account for ROI, the debate continues regarding the best and most modern methods used by firms to evaluate their advertising expenditures. Given the lack of a universally accepted model for measuring return on investment (ROI) from Internet advertising, it is worth reviewing the promising methods that have been advanced in the literature. Each of the methods reviewed below (see Figure 1) has the potential to better equip practitioners with tools to tackle this question, even if not used exclusively or in their entirety. Four key methods have been identified through a comprehensive literature review and are shown in Figure 1, which also summarizes the key measures used and the advantages and limitations of each technique. Each of these articles contributes to the literature by providing a critical examination of how to contextually calculate accurate ROI from both advertisements placed in traditional Internet outlets and in social media platforms. · Click-through : The number of times a user clicks on the advertisements. · Cost-per-click : The amount spent by an advertiser to generate a click-through. · Cost-per-action/lead (CPA) : The amount spent by an advertiser to generate one lead, one desired action, or simply information on a user. Here the advertisers pay based on the number of users who complete the desired action. · Cost-per-sale (CPS) : The amount spent by an advertiser to generate one sale. Here, the advertiser pays based on the number of users who actually purchase something. The use of these metrics in evaluating ROI has several advantages for marketers. First, these items have each been used by firms since the inception of the Internet and provide a transferable way to measure ROI between various forms of Internet advertising (display, animation, video, etc.). This consistency allows marketers to evaluate with regularity various types of Internet advertising campaigns. Moreover, each of these metrics is financially driven, which provides an objective (even if imperfect) view of the direct returns of a firm’s financial expenditures. Cost-per-sale is a bottom line measure that comes closer to the types of financial measures typically used to calculate ROI at the corporate level. The use of such a measure makes it easier for decision makers to evaluate a campaign’s financial performance as compared to the performance of past and future advertising expenditures. However, these measures also have limitations that must be considered by advertisers. In addition to not using revenue as a dependent variable, they do not account for non-financial benefits, such as brand awareness, goodwill, brand equity, and other measurements that impact a firm. In addition, there are factors that are not accounted for in the model that might contribute to the results. The model also does not account for ad placement location, for example, which can have a dramatic impact on the metrics listed above due to Web traffic and site popularity; it also can not assure the isolation of all factors that may impact sales. As a result, it is more applicable when direct response is desired and more accurate for advertisers who do not engage in as many integrated marketing communications programs, but rather focus heavily on Internet advertising. The issue here is that the click-through rate may be at least partly a function of advertising in other media. The next method of measuring ROI is very specific to advertising and is presented by Cheong, Leckenby, and Eakin (2011). Their Multivariate Beta Binomial Distribution (MBD) model estimates magazine and Internet advertising exposure and frequency to its desired target audience. Their method is based on three previous theories: Hyett’s Beta Distribution, Waring's Theorem, and Greene’s Personal Media Probability Method (Cheong et al., 2011). The model assists advertisers in measuring ROI by accounting for Internet advertising exposures while eliminating negative exposure probabilities and asymmetrical media schedules. This helps firms more accurately estimate the exposure levels of their advertisements, which directly contributes to their calculations of ROI. In their experiment, the authors collected data from .comScore Networks, a leading audience measurement firm, which included data from 5,000 panelists. These panelists viewed Internet sites with randomly inserted advertisements placed on rotating exposure schedules (Cheong et al., 2011). The number of times a panelist was exposed to those ads was recorded; the number of exposures was estimated before the experiment was conducted. Duplicates and errors were accounted for and eliminated from the results. The number of advertising exposures per cycle was also varied to further eliminate recall errors. The MBD model offers advertisers a more consistent way to estimate reach frequency from its online advertisements. This allows advertisers to better predict the best locations for ad placements online by creating a more accurate estimation of the reach of their campaign. This will help advertisers eliminate wasted ad spend. In addition, the MBD model will enable advertisers to review the placements of their advertisements to estimate how many members of their target audience viewed and responded to their advertisements. This model presents several advantages. First, the authors argue that this model eliminates negative exposure probability levels, which have plagued earlier multivariate media exposure models (Cheong et al., 2011). This allows for a better reach and distribution estimate, which can be used by firms to more accurately calculate ROI. Also, the model effectively tests for asymmetric insertion levels (Cheong et al., 2011). Therefore, this model can be used to effectively calculate reach estimations without negative probability values (Cheong et al., 2011). However, there are several limitations to consider when using the MBD in calculating ROI. While exposure models have their advantage in terms of giving precise figures of exposure to the target audience, they of course cannot get at some deeper measures, such as attitude and increase in loyalty. In addition, and perhaps most critically, the MBD treats all forms of Internet advertising (video, display, rich text, etc.) the same, and does not account for perceptual differences among each form (Cheong et al., 2011). This has serious implications for calculating ROI due to the difference in cost to the firm between simple text advertisements and more expensive forms of Internet advertising, such as video or animation. Nonetheless, in combination with other methods, this technique can give the advertiser a precise estimate of how much needs to be spent to achieve reach and frequency goals, thereby allowing for the advertiser to engage in objective and task budgeting. The use of traditional ROI measures in social media has frustrated advertisers. The evolution of social media is designed to counteract the way messages were traditionally delivered. Fisher (2009) makes the argument that ROI in social media takes a different form. Fisher argues that ROI really means return on influence or return on engagement; that is, social media is meant to influence perception or provide a forum for customers to directly engage with a firm. Unlike traditional media, there is more chance for the consumer to become engaged with the ad in the context of the site (Taylor, 2010). Therefore, ROI in a short-term financial sense does not measure the true impact of a social media campaign. Fisher (2009) notes that 44% of the INC. 500 had an active blog as of 2009, 34% of a firm's audience posts opinions about a brand on the company's blog, and 36% of consumers think more positively about a brand that has a blog (Fisher, 2009). In such an environment, it is important to examine the degree to which the consumer becomes engaged with the brand. · Social media sites : Unique Visitors, Cost per unique visitor, Page views, Visits, Return Visits, Interaction rate, Time spent, Video installs, Relevant actions taken. · Blogs : Conversation size (number of sites, links and reach of a conversation whose content includes conversation phrases relevant to the client), Site relevance (Conversation density, Author credibility, Content freshness and relevance). These definitions and their use to measure ROI offer several advantages to the firm. First, while not focused on short-term financial return, the aforementioned benchmarks effectively account for key non-financial performance metrics that must be considered when evaluating the overall impact of social media advertising on the firm. Also, these measurements provide the firm with a holistic measurement of the total impact of their social media advertising campaigns. Measurements like conversation size and author credibility as ROI measurements are leaps forward from the older and less accurate measurements discussed earlier in this paper. In this way, the advertiser can get a complete view of the degree to which the user is not only exposed to the ad site or blog, but also the degree to which visitors are truly engaged by the site. Indeed, these measures, while more qualitative in nature, provide the types of deep insights recommended by Schultz and Schultz (1994). As with other techniques, these methods have limitations that must be considered by firms. The benchmarks for calculating ROI do not include many financial measurements. While subjective measurements of an advertisement’s impact are important, the financial impact of a campaign must also be considered when evaluating the total ROI. As a result, it may be necessary to combine these measures with more financially oriented measures similar to the first two techniques described above, as financial staff may not be satisfied with their ability to track their returns to the firm. The focus on non-financial measures also makes it more difficult to directly evaluate the shorter-term impact of one advertising campaign over another. In a 2009 Marketing Management article, Crosby introduces a brand scorecard to measure the customer experience resulting from marketer expenditures to promote the firm. Each measurement is outlined below (Crosby, 2009), and each level represents a hierarchy of a customer's experience with the firm. Moreover, these results can be used by marketers to evaluate a firm's ROI on marketing dollars spent as part of a brand scorecard covering both financial and non-financial metrics. Each level represents a portion of the firm that is impacted by its advertising spending. Level 1 metrics cover purely the financial portion of the firm, including widely used numeric measurements to judge a firm’s performance. Level 2 examines the demand pull generated by a firm. This includes a brand’s recognition in the marketplace, as well as consumer loyalty and preference for one brand over another. Level 3 examines improvements made by the firm to attract and retain its customers, such as improved customer satisfaction and customer generated fan sites, as can be seen on social media platforms like Facebook. Finally, Level 4 measures the investment in a firm made by outside parties. This model presents several distinct advantages to marketers. While the article does not explicitly explore the application to the interactive advertising context, it clearly can be addressed via several of the measures in the above technique – plus a few additional attitudinal and long-term image/equity based measures. For example, in order to truly measure the total ROI to the firm from an Internet advertising campaign, it would be advantageous for the firm to explore its ROI in the context of this model. Using Level 1 metrics, a firm would document how much sales have increased after running an Internet campaign, as well as how that increase in sales impacted the firm’s stock price or its discounted cash flow. In addition, a firm would want to calculate and track how its advertising campaign impacted brand recognition and customer loyalty in the marketplace. Moving forward, customer interaction, through sites like Facebook, provides advertisers with valuable information about their consumer base that can be used to further target future campaigns. Finally, Internet advertising and all of the aforementioned metrics can directly contribute to outside investment in a firm. A key advantage of applying this model to the interactive context is that it provides a balanced measure in terms of both financial and non-financial criteria, as well as using both short-term and long-term criteria. The inclusion of financial metrics is critical because firms make decisions based on financial benchmarks. However, there is also a clear need for marketers to account for non-financial means of calculating ROI, which likely can be measured with more precision. Second, this model outlines a hierarchy of metrics in order of importance from one to four and contributes a cause and effect hierarchy for marketers (Crosby, 2009). This allows decision makers to prioritize how they view their brand exposure performance in its calculation of ROI. However, this model also has limitations. Most marketers tend to focus on Level 1 financial and market share metrics as a measurement of ROI (Crosby, 2009). However, at each level a firm can see returns that they might not be able to directly tie to their internal measurement of advertising expenditures. For example, a firm may find that an Internet advertising campaign that has already been evaluated from a previous quarter may have resulted in additional investment by a multi-national firm. While the current advertising campaign may get credit for that investment, it was actually the result of a previous campaign that management might have deemed a failure because of its low perceived ROI. Another limitation of this model is that it does not effectively account for returns long after the completion of a campaign (i.e., lagged effects). Levels 2, 3, and 4 measure long-term benefits to a firm (Crosby, 2009). These are sometimes not counted by the company when evaluating the effectiveness of an Internet advertising campaign in the short-term. This flaw in how ROI is currently being measured results in inaccurate measurement of benefits generated by a campaign. It is clear that the ability to capture or at least begin to capture return on investment (ROI) from interactive advertising has advanced considerably in recent years. While early methods such as website hits were highly inadequate, newer techniques are providing considerable insight, even if they are not perfect. It is clear that there are several alternative types of measures that can be used to measure ROI from interactive advertising programs. To gain a holistic picture of ROI and the best view of overall returns, it is necessary to attempt to capture short-term financial effects (e.g., cost-per-sale) when possible, but it is also necessary to capture the impact on attitudes toward the brand, consumer engagement, and ultimately brand equity. While Ambler and Roberts (2008) are correct about the lack of ability to develop perfect measures of ROI from marketing, it is nonetheless useful to at least attempt to come up with some estimate of shorter-term returns from interactive advertising. Granted, this is likely to be a more effective measure when direct response advertising is used and/or there is evidence that advertising in other media is not driving a high proportion of visits to the site. However, it is likely to be influential among those who authorize budgets within an organization. Over time it is worthwhile for those trained in advertising and marketing to emphasize the importance of longer-terms measures, especially consumer engagement and the impact on brand equity, as further justification for needed budgets. Going forward it would make sense for researchers to work toward being able to measure ROI at all four levels of the brand scorecard approach as accurately as possible. While it is possible to get some good measures based on short-term financial measures, attitudes, and engagements using the other existing techniques, more effective techniques for measuring activity and impact on brand equity are needed going forward. To this end, research focused on the effectiveness of ROI measures in an interactive, advertising-specific context is needed with a focus on what measures are best at various levels. Clearly, several of the existing exposure, attitudinal, and engagement measures provided by the newer techniques are promising in this regard and represent a clear advantage over traditional techniques. A study of the level of managerial satisfaction with various methods of ROI measurement would also be worthwhile to be able to assess best practices in the eyes of the manager. Finally, studies documenting the effectiveness of these techniques in predicting actual returns, when available, would be highly valuable in allowing for the assessment of various measures. 1.Ambler, T., & Roberts, J. H. (2008). Assessing marketing performance: Don't settle for a silver metric. Journal of Marketing Management, 24 (7/8), 733-750. 2.Barnes, S. J., & Scornavacca, E. (2004). Mobile marketing: The role of permission and acceptance. International Journal of Mobile Communications, 2 (2), 128-139. 3.Carroll, A., Barnes, S.J., Scornavacca, E., & Fletcher, K. (2007). Consumer perceptions and attitudes toward SMS advertising: Recent evidence from New Zealand. International Journal of Advertising, 26 (1), 79-98. 4.Cheong, Y., Leckenby, J. D., & Eakin, T. (2011). Evaluating the Multivariate Beta Binomial Distribution Model for estimating magazine and Internet exposure frequency distributions. Journal of Advertising, 40 (1), 7-23. 5.Chiagouris, L., & Wansley, B. (2000). Branding on the Internet. Marketing Management, 9 (2), 34-38. 6.Choi, Y.K., Hwang, J.S., & McMillan, S.J. (2008). Gearing up for mobile advertising: A cross-cultural examination of key factors that drive mobile messages home to consumers. Psychology & Marketing, 25 (8), 756-768. 7.Clancy, K. J., & Stone, R. L. (2005). Don't blame the metrics. Harvard Business Review, 83 (6), 26-28. 8.Crosby, L. A. (2009). Getting serious about marketing ROI. Marketing Management, 18 (3), 10-11. 9.Fisher, T. (2009). ROI in social media: A look at the arguments. Journal of Database Marketing & Customer Strategy Management, 16 (3), 189-195. 11.Frieswick, K. (2001). "New brand day." CFO Magazine http://www.cfo.com/article.cfm/3001802, accessed November 20, 2011. 12.Kumar, V. V., & Shah, D. (2004). Pushing and pulling on the Internet. Marketing Research, 16 (1), 28-33. 13.McMillan, S. J., Hwang, J. S., & Lee, G. (2003). Effects of structural and perceptual factors on attitudes toward the website. Journal of Advertising Research, 43 (4), 400-409. 15.MagnaGlobal. "Megabrand Spending by Media," (2005). Advertising Age, Sept. 12, 34. 16.Neff, J. (2005). ROI: The marketer's obsession; Fallacies and confusion abound as all sides scurry around in the name of metrics. Advertising Age, (June), p.S1. 17.Okazaki, S. (2008). Mobile-based word-of-mouth among Japanese youth: How new brand referral campaign works. Psychology & Marketing, 25 (8), 714-731. 18.Okazaki, S., Katsukura, A., & Nishiyama, M. (2007). How mobile advertising works: The role of trust in improving attitudes and recall, Journal of Advertising Research, 47 (2), 165-178. 19.Percy, L., & Elliott, R. (2005). Strategic Advertising Management, 2nd Edition, Oxford, England: Oxford University Press. 20.Schultz, D.E., & Schultz, H. (2004). IMC: The Next Generation. New York: McGraw-Hill. 21.Southgate, D., Westoby, N., & Page, G. (2010). Creative determinants of viral video viewing. International Journal of Advertising, 29 (3), 349-368. 22.Taylor, C. R. (2009). The six principles of digital advertising. International Journal of Advertising, 28 (3), 411-418. 23.Taylor, C. R. (2010). Measuring return on investment from advertising: 'Holy grail' or necessary tool? International Journal of Advertising, 345-348.